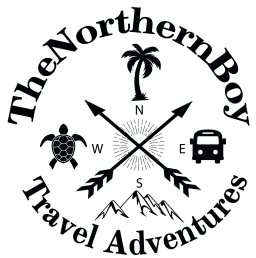 Are you visiting Thailand and want to see the best things in Pai Thailand? 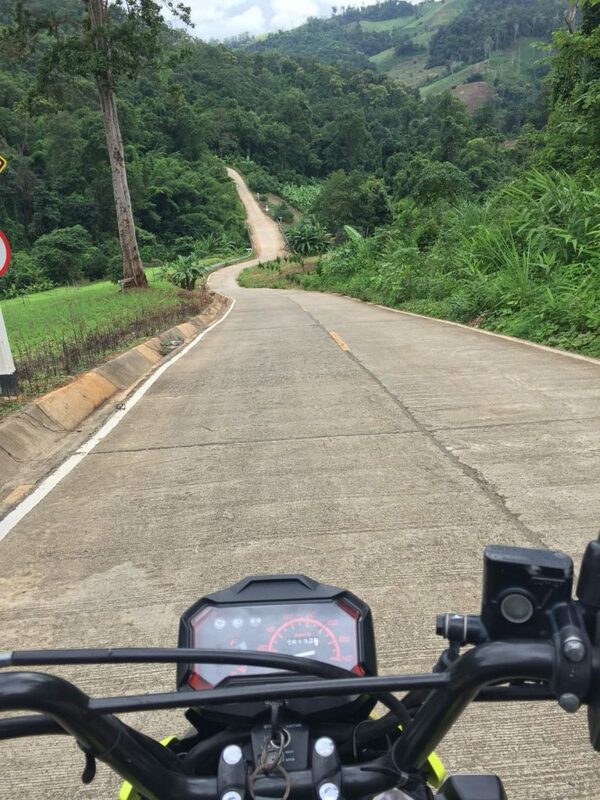 Good, because I managed to the very 10 fun things to do in Pai in just one day on a sweet personal scooter tour and I am going to share wit you the most awesome things in Pai. 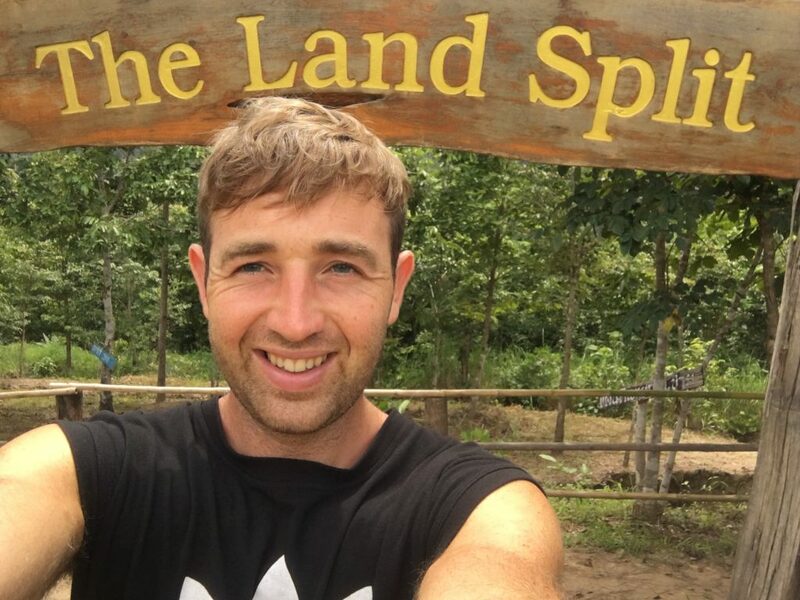 We arrived with just one full day on our hands to do 10 fun things in Pai in one day. There is only thing to do with this, hire a trusty scooter, fill it with gas and let’s hit the road for a dusk till down adventure. Pai is a town with a cool quirky vibe and got plenty going for it. 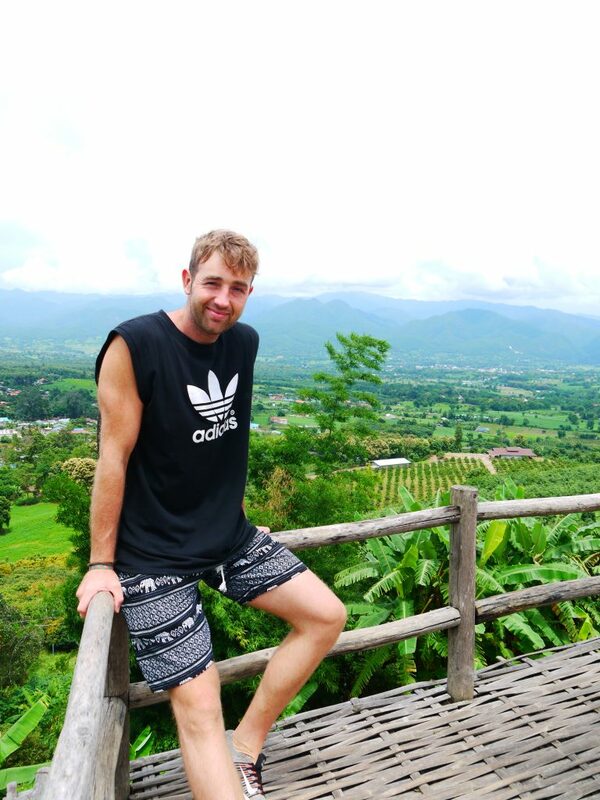 I’ve heard off many backpackers that Pai is up there as one of the best places to visit in Thailand. There’s something in Pai for everyone to do and you will discover this on your visit here. 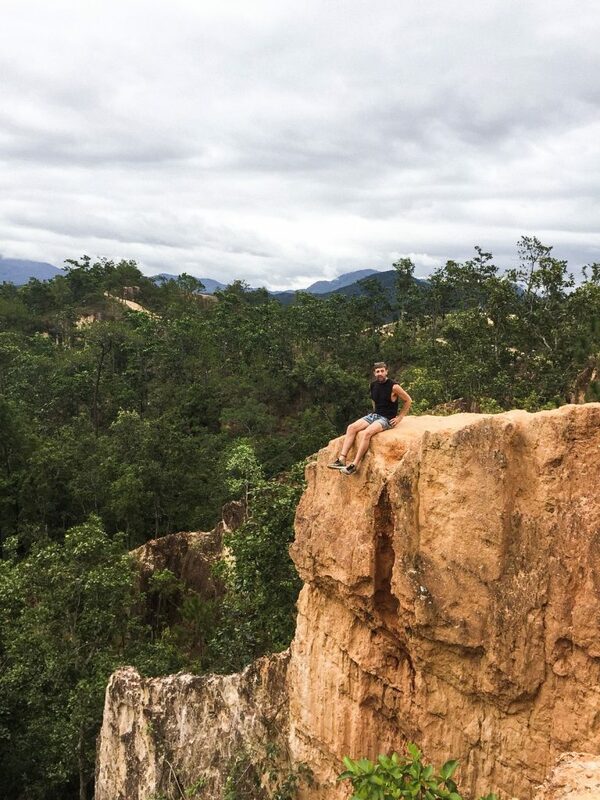 There is plenty of mega things you can do in Pai. For example, the pai canyon, the land split or the big white Buddha. I want to share with you all the information you need for visiting these top tourist spots in Pai. 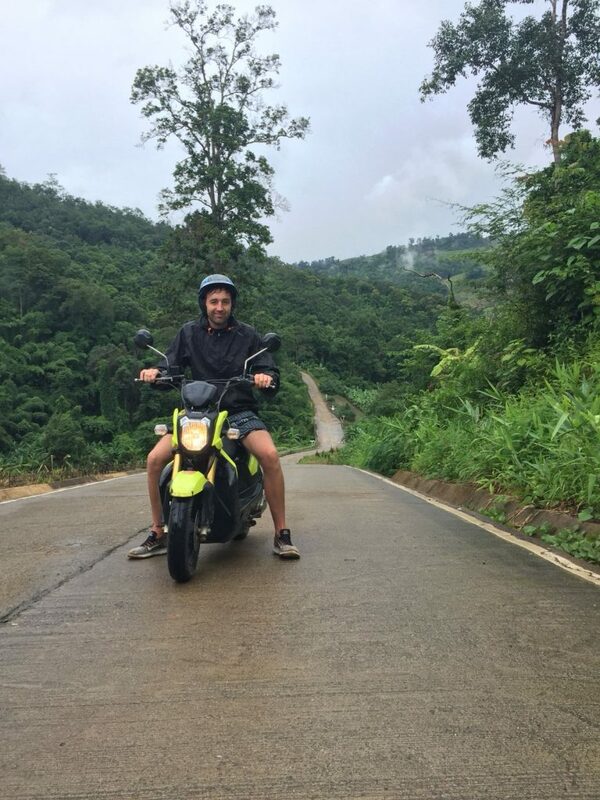 To do all these top tourist spots and free things to do in Pai, you are going to need to hire a scooter. Where to get scooter rentals in Pai to complete the top 10 things to do in Pai? Scooter rental in Pai is common for visiting backpackers. Therefore, there are plenty of places to rent bikes in Pai. Don’t worry if you haven’t got an international license, it’s very uncommon for police stopping motorcyclists in Pai. Unlike other places to visit in Thailand. I haven’t got an international licence and I didn’t have a problem. The cost of price rental in Pai is funnily enough the same as the motorbikes engine power. For example, if the scooter is a 150cc, then you will pay 150 baht ($5.50) for 24 hours scooter rental in Pai and this is cheap for 24 hours rental. Gas is also crazy cheap. It cost me 60 baht ($2.75) for a full tank, sweet. 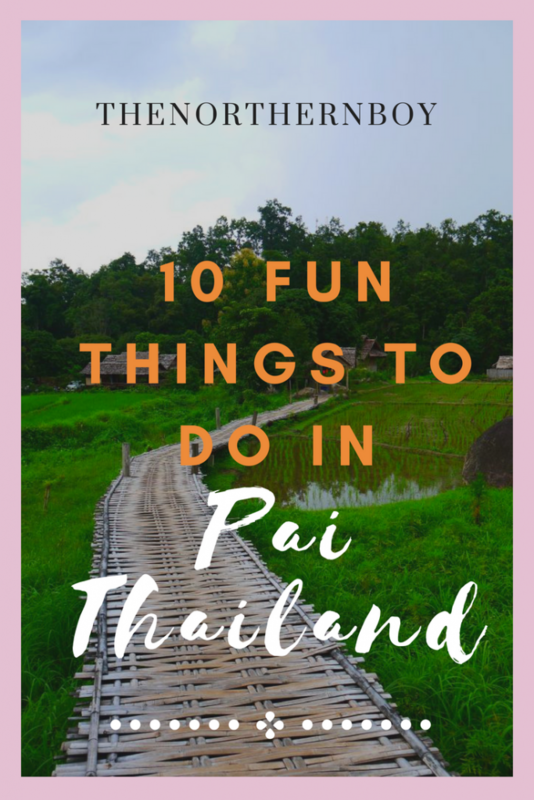 We did cram the 10 fun things in Pai in just one day, but we didn’t rush on the roads and you shouldn’t either. I seen some nasty grazes on backpackers in Pai. Don’t be one of them just take your time man, you will have plenty of chances to save time by running up and down the steps to the best things in Pai! An epic little canyon in Pai that has a few narrow edges to get some great photos. 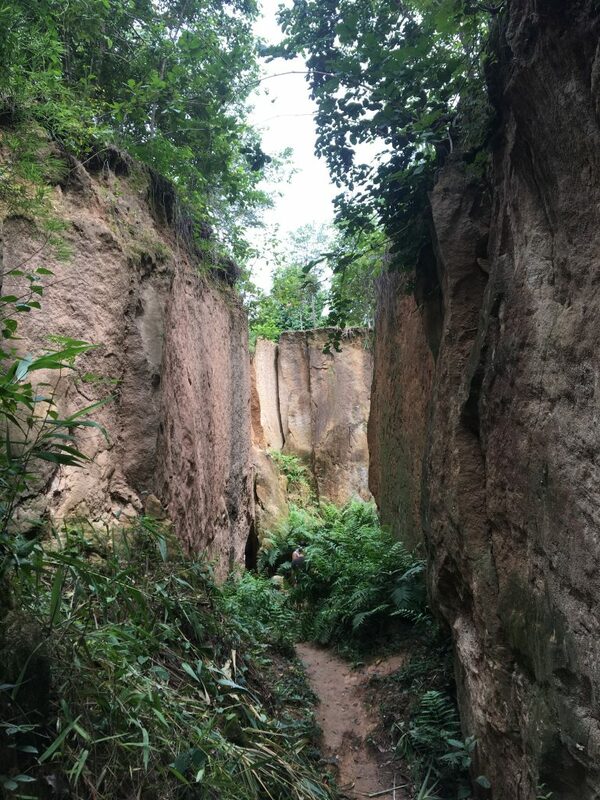 However, don’t expect anything to spectacular, I obviously knew it wasn’t the American Grand Canyon but I wanted it to be something along the lines of the great American canyon. Nevertheless, it’s still a cool place to visit. The Pai canyon cost is completely free, which is a surprise but I ain’t complaining and parking is also free. You should try to get here for sunrise or sunset to see the unique orange rockery lit up by the moving sun. Please be careful, the sides are sloppy with moving rockery and some areas are very narrow. where is the Pai Canyon? A weird and wonderful Pai land split in the farmers land caused by an earthquake in 2008 and every year the land spilt continues to widen. You also get chance to taste the local goods grown in Pai for free, I tasted the finest fruit juice and had some tasty banana chips. All they want is a small donation or to purchase some of the goods. It is cool how the land split is formed, but it’s not something I would put on top of my best things in Pai in a one day list. But, it’s worth a visit for the juice I mentioned. Where is the Pai Land split? Southeast Asia has some of the most amazing waterfalls in the world and there are some epic waterfalls in Pai. I got to see a few of Pai’s best waterfalls. However, I preferred the Mor Paeng Waterfall as there is a little more to see and you can relax on some cool rocks. Just take your time here it can be slippy in some areas. 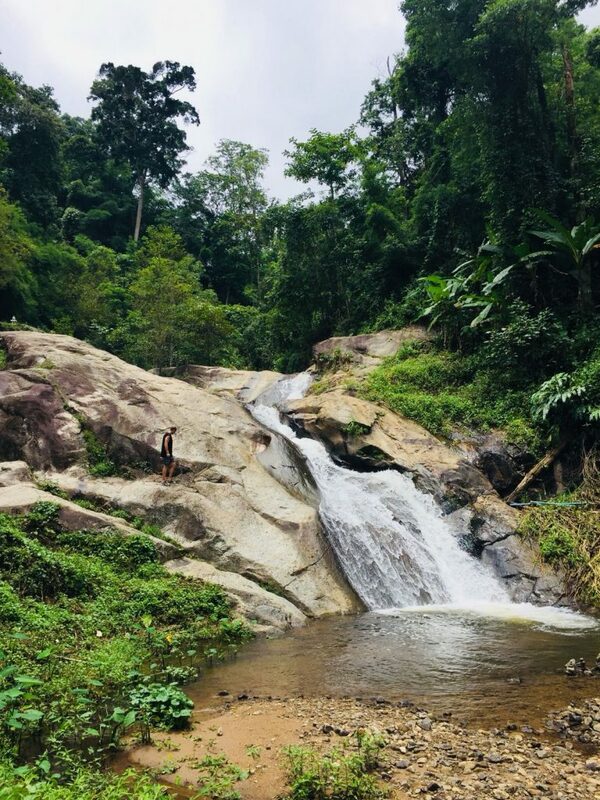 The waterfalls in Pai are not to far from the centre of Pai, it will take you between 20-25 minutes to reach them by scooter. The cost of the Pai waterfalls is zero. It’s all FREE and parking is free. Not bad eh?! Where is the Mor Paeng Waterfall? The amazing Pai hot springs, a surreal experience and one of most awesome best things I did in Pai. I know they’re the hot springs of Pai but a part of me didn’t expect them to be hot. Funnily enough upon dipping my toe in the Pai hot spring, it was warm. The hot springs in Pai are warm, have amazing scenery around them and have the clearest water you will ever see. The Pai hot springs cost for a visit, but it’s worth it for the experience. There is a cost of 200 baht ($8) for entry to the national park and then 20 baht ($0.70) for entry to the Pai hot spring. The Pai hot spring hours are 8am-6pm everyday. Where is the Pai hot springs? You can See the Big Buddha In Pai on the hill from most places in Pai, it’s hard to miss the giant white Buddha structure on the green hill. The Pai big Buddha is near the centre of Pai, so you can either cycle there, walk or hire a scooter. The big Buddha in Pai is epic for seeing some amazing views. You can see for miles and it’s even better when the weather in Pai is good. It’s free to enter the big Buddha, however girls need to wear a sarong. But these make a sweet Instagram picture. Also, you have to climb some steps for 5 minutes to get to the top of the big Buddha. 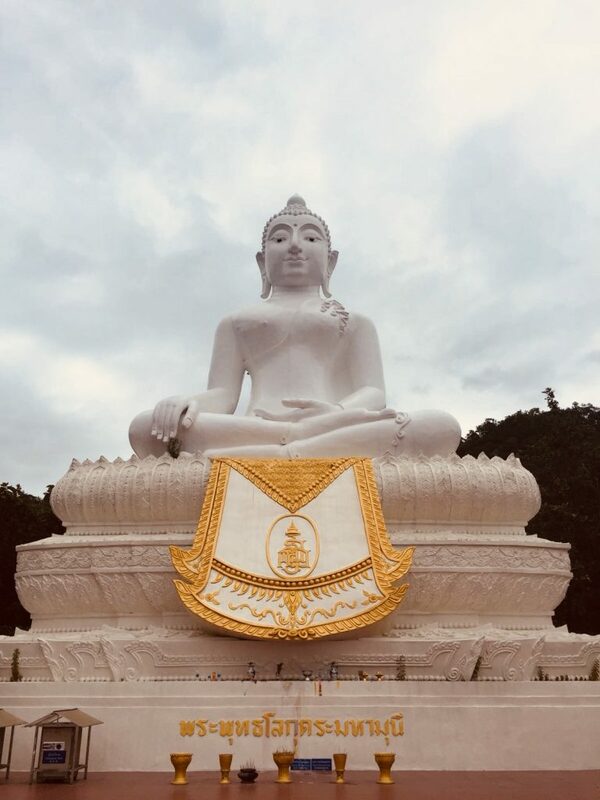 Where is the big Buddha in Pai? Yes we visited the Pai Fitness Centre, even the we had a busy day to do the best things in Pai, we still had time to fit a gym session. We only spent an hour in this great little gym in Pai. The Pai fitness centre has everything you need to have a good session whether its cardio, strength or yoga training. There is also drinks there for sale and sweat towels to use for free. The Pai gym cost is just 40 baht ($1.40) per person, this includes everything and there is also parking outside the fitness centre. Health is priceless YO. Where is the Pai Fitness centre? A cool vibrant shopping area in the heart of Pai. You can find local goods such us clothes, gifts and food at the Pai Walking Street. There’s a mega atmosphere here when the sun drops, the locals of Pai come out to hustle and the tourists want to buy goods. Remember your bartering skills! Don’t pay the asking price. Where is the Walking street in Pai? 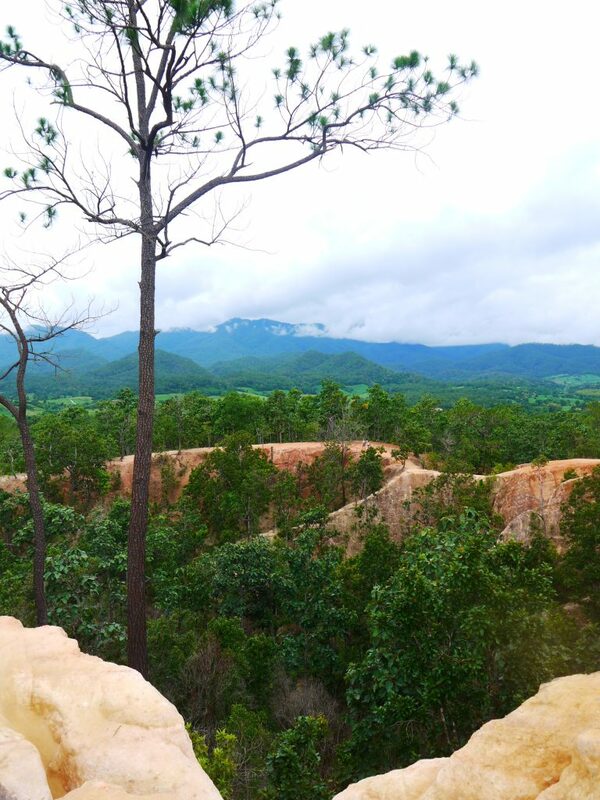 We randomly stumbled across this stunning Yun Lai viewpoint in Pai, but man was we glad we found this gem of a view. You arrive to this view by driving though a cool little arty village. 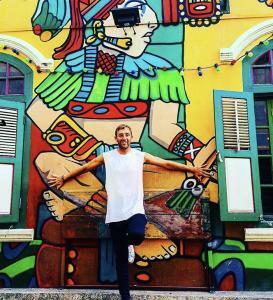 I say arty because there are lots of sweet wall art and unique architecture. It’s a 20 Baht ($0.60) entry fee to the top point, but it’s a great chill out area and there is food and drink available there. To be fair it’s good to just relax for half an hour after your day of doing the 10 awesome things to do in Pai Thailand. Where is Pai’s best viewpoint Yun Lai? An unreal 800 metre stretch of Pia’s bamboo made bridge, over the top of a vibrant green rice field and surrounded by picturesque mountains. This is one of the most sweetest picture spots you will find in Pai and it’s definitely one of the best places to visit in Pai. Also, there is rain cover dotted about on the bamboo bridge, luckily enough as it started absolutely hammering it down when I was in the middle of the bridge. But I can think of worse spots to have to wait for the Pai weather to ease over! 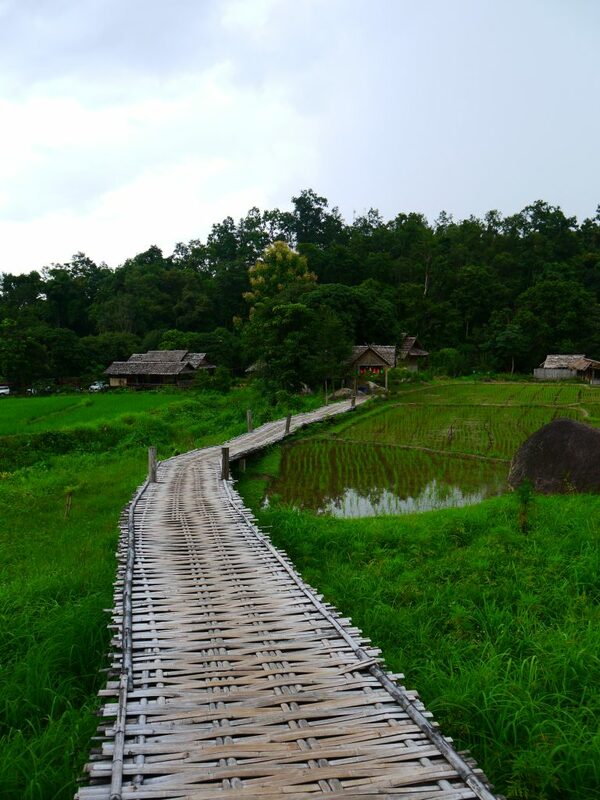 The Pai bamboo bridge is one of my favourite on the 10 awesome things to do in Pai backpacker’s list. 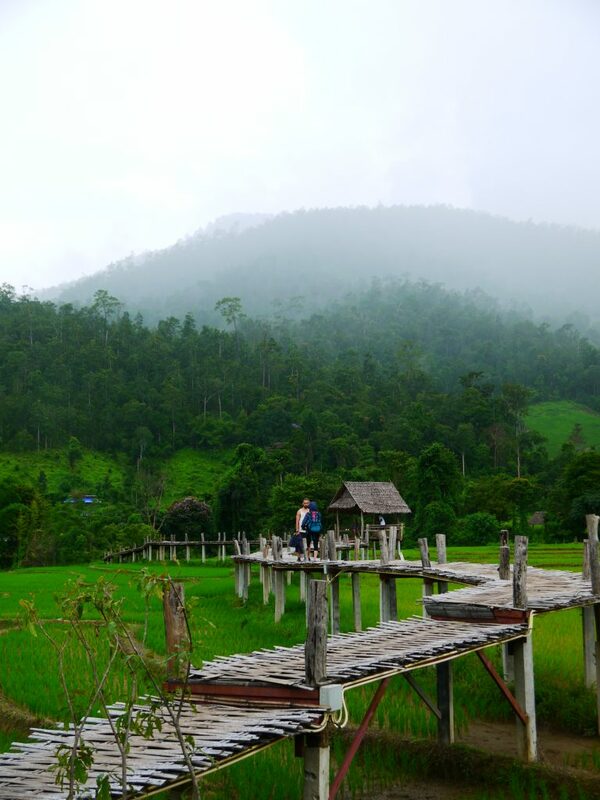 The cost of the bamboo bridge in Pai is totally free to visit but the scenery there is worth a million dollars. Where is the bamboo bridge in Pai? Nail on the head statement smoothies in Thailand are a big thing! There is not better feeling than a freezing cold banana smoothie in the hot Pai weather. I don’t think there’s a day that goes by when I don’t have a fresh smoothie, therefore I am highly recommending a sweet tasting smoothie in Pai. Where are the best smoothie and food stands in Pai? No map here because they’re dotted around all over the place and they’re easy to find! 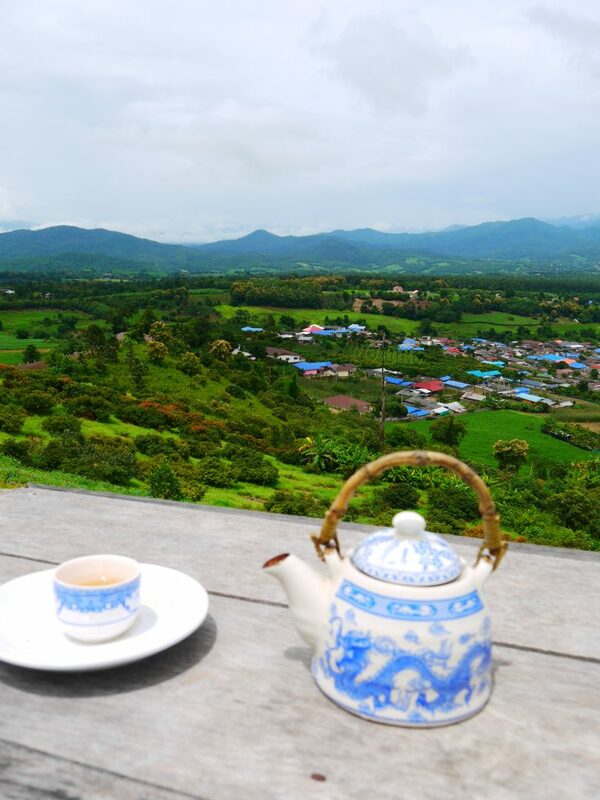 You will never struggle to find accommodation in Pai. The number of hostels in Pai outnumbers the local private houses. The hostels in Pai are in a great location right next to centre. There’s also luxury accommodation in Pai which can be away from the centre in the quieter hills. Therefore, it’s what ever type of trip to Pai you’re on, there is plenty of epic places to stay in Pai. The long neck village in Pai, this really is a shambles. You literal go here to get a couple of pictures with girls dressed up and it’s just a money-making scam. They are only here to make money and there is no sense of tribal historic tribe here! It’s just a money scheme so avoid this if you can. 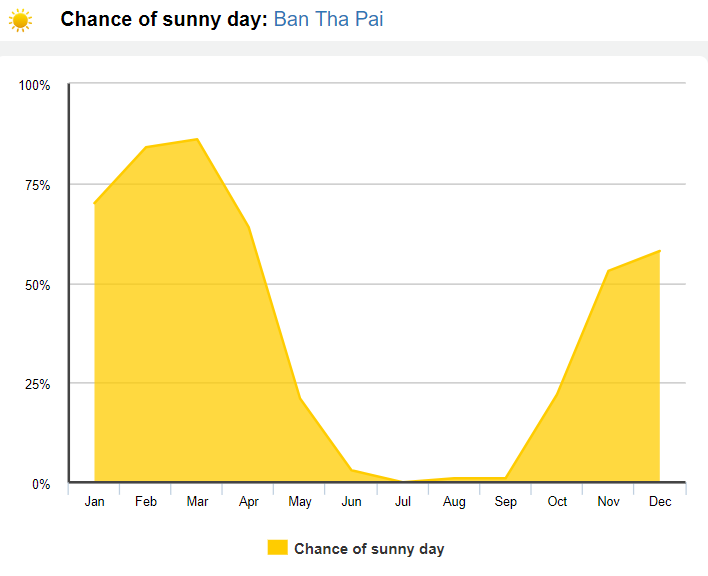 The weather in Pai and best time to visit? The Pai weather is mostly hot throughout the year, so visit this place in Northern Thailand shouldn’t be a problem for the hot temperatures. However, the weather in Pai is rainy season from May to October. I visited Thailand’s Pai in August and was only there for 2 days, however the sun was shining and I only seen rain in Pai once! So just check the live updates on the weather in Pai and plan your trip around that. But, like I said I was there in rainy season and I had great weather in Pai! Please subscribe below if this post has been helpful. What an awesome post. I read your article. 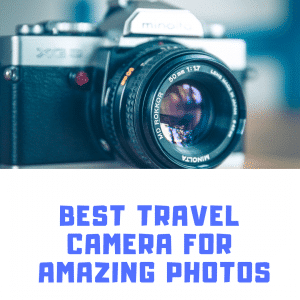 You write a very good post with beautiful photographs. Thanks for sharing this information about Pai Thailand.